The wildlife and other outdoor surroundings create an inviting atmosphere in Chateauguay. This romantic and relaxing city is known for its bird watching, shopping and restaurants. Saint Joseph's Oratory and Notre Dame Basilica are just a couple of the must-sees in the area. Many rental homes come with outdoor spaces, separate dining areas and full kitchens, perfect if you want to enjoy some home-cooked meals. Fly into Montreal, QC (YUL-Pierre Elliott Trudeau Intl. ), the closest airport, located 6.1 mi (9.8 km) from the city center. If you can't find a flight that works for your travel itinerary, you might consider flying into Montreal, QC (YHU-St. Hubert), which is 19 mi (30.5 km) away. Where to stay around Châteauguay? 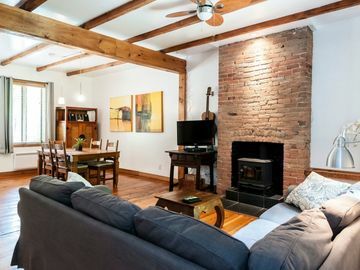 Our 2019 accommodation listings offer a large selection of 992 holiday lettings near Châteauguay. From 161 Houses to 775 Condos/Apartments, find the best place to stay with your family and friends to discover Châteauguay area. What is the best area to stay when travelling to Châteauguay? Can I rent Houses in Châteauguay? Can I find a holiday accommodation with pool in Châteauguay? Yes, you can select your preferred holiday accommodation with pool among our 153 holiday homes with pool available in Châteauguay. Please use our search bar to access the selection of holiday rentals available.